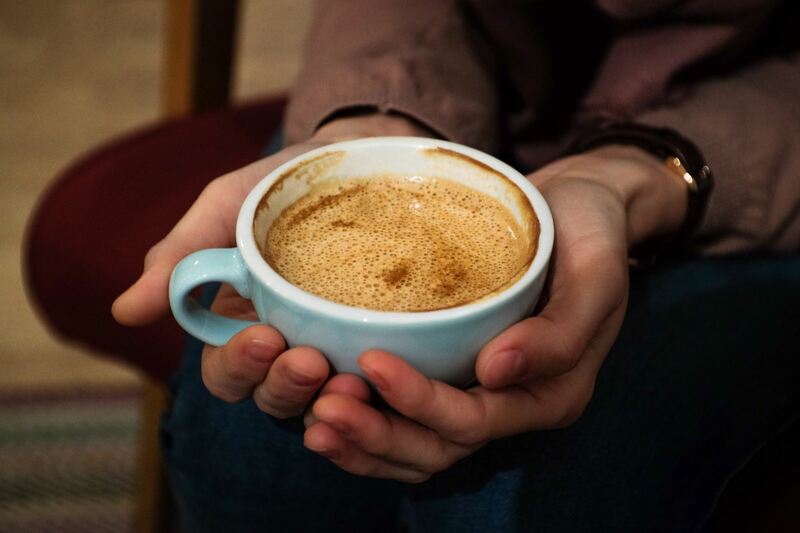 One might not expect to draw much more than a few sweet, flavorful sips from a frothy cafe au lait; unless of course, one were to take a few moments to delve deeper into its composition, into its design, its rhythm, its offerings. Upon closer examination in the quiet of the coffee shop, much more can be gained, experienced, and enjoyed. Truly, the breadth of one cup is an infinite measure, limited only by one’s desire to pursue the full extent of its essence. Initially, one perk can be found in the warmth emanating beyond the walls of the cup. It is a welcome intrusion to the skin and a pleasing penetration to blood and bones. Its progression soothes, softens, alleviates and relieves, while relaxing the muscles and calming the nerves. This warmth is healing, pleasurable, and good, evoking a sense of comfort, of security, and of coziness. One might suspect, given the richness found in this sultry cup of coffee, that little more could be gained from it. On the contrary, there is much more to offer the partaker. The scent, should one take the time to appreciate its complex and earthy aroma, stimulates the senses, quickens the spirit, awakens the mind, and inspires the soul. One discerning whiff, if properly regarded, can do all of that. Of course, there are many more dividends contained within this cup, just hoping to be drawn out. It’s aroma enhances the periphery. The ambiance, the lighting, the sights and sounds of the coffee house; all of their qualities are accentuated, augmented by the fragrant bouquet of roasted coffee beans. The setting is so befitting, so rife for creating, for imagining. It is a launchpad for ideas, a birthplace for the soul. All of this before one word is spoken regarding the treasures discovered within the flavor of the coffee itself. Some 172 descriptive words are known to be used by coffee enthusiasts for this purpose alone. Obviously, there is much to be gained, experienced, and shared relating to various coffee house exploits. The degree to which one experiences them depends on ones perspective. Genuine coffee aficionados wish to understand all things coffee. They develop an extensive knowledge of its properties and characteristics. They become a part of the fabric of coffee culture. They study, seek, survey, and sip incessantly, in order to harvest every single drop of goodness, savoring each occasion to the fullest. It is from this perspective that The Art of Pursuit was born. A home to those who are seeking, striving, endeavoring, and achieving, The Art of Pursuit is a place where thought and ideas pertaining to various pursuits can be shared. It is a venue where knowledge can be gained, where tools can be found, and resources can be acquired, all in the interest of helping others to successfully achieve their personal pursuits. Thank you for exploring The Art of Pursuit.